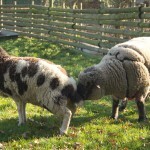 Love is in the air for our sheep! That’s right, it’s tupping time on the farm and that means our two stud rams (or tups) are getting to spend a bit of time with a number of our ewes. Frankie the Oxford Down and Billy the Whitefaced Woodland ram are getting to know the girls and will “cover” their respective ewes over two periods of seventeen days. This increases their chances of mating during oestrus, a 30 hour period every 17 days during which the ewes are most fertile. Frankie exhibiting flehmen, with a curled upper lip. 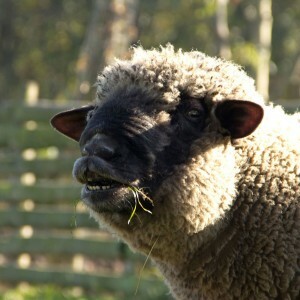 The rams can detect where the ewes are in their cycle by smelling their hormones. There is an area beneath the upper lip which is particularly sensitive to hormones called the vomeronasal organ. To increase contact between the scents and this area, the boys sniff deeply with their upper lip curled back, exhibiting the flehmen response. In preparation for tupping, we’ve been pampering the ewes with extra feed and access to our richest grazing to encourage them to release more eggs. Both rams and ewes have also been health checked and had a pre-tupping pedicure. To help keep track of when our sheep are breeding, both rams are fitted with a harness holding a raddle, which marks the ewes as they mount them. We can change the colour of the raddle, which allows us to see when a ewe has been mounted. If a ewe has lots of colors on her back, it suggests that a ewe did not conceive on the first mating, as she should stop being receptive once pregnant. Likewise, if a ewe shows only the first colour we used, she may have conceived right away and might be among the first to lamb. 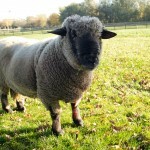 Both of our studs are experienced, proven rams, who have already sired many lambs here at Mudchute as well as further afield. 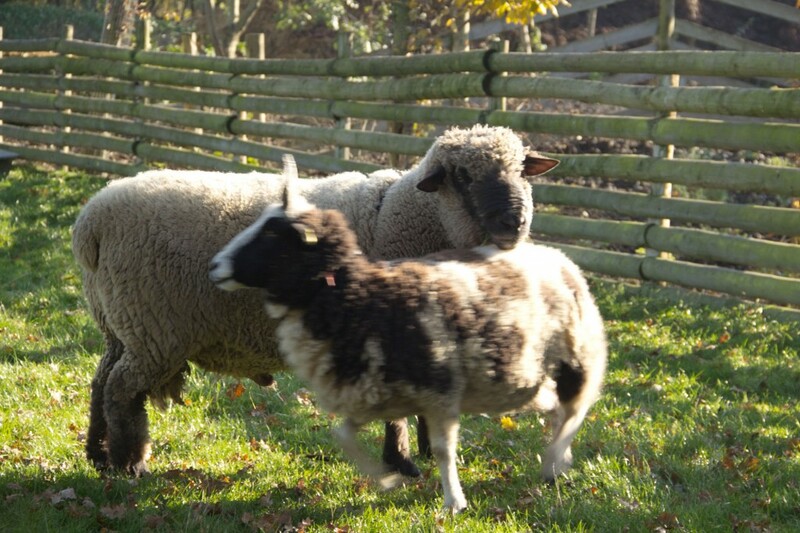 Although we didn’t breed our own flock last year, both rams acted as studs, with Frankie at Surrey Docks City Farm and Billy on a private farm. 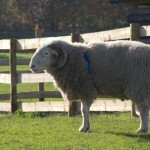 This year, you will also notice a number of Jacob ewes in with Frankie the Oxford ram. These ewes are from Stepney City Farm and will return to Stepney after tupping. We’ll be interested to see whether the Oxford/Jacob lambs will take after their mums or dad. If all goes to plan, we’ll be lambing in late April next year as ewes typically give birth after a 5 month gestation period (an average of 147 days). Here in the UK, shepherds traditionally tup in November, with tupping around Fireworks night for lambs born around Easter, after the worst of the winter weather. 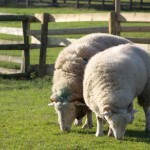 The number of lambs born to each ewe may vary, but both Oxford and Whitefaced ewes typically give birth to either twins or single lambs, although we have had triplets in previous years. 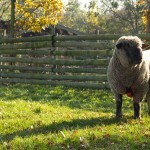 If the ewes do conceive, the fertilised embryo will implant 21 to 30 days after breeding. However, we will not see any outward signs of their pregnancy for quite a few months as most of the embryo’s growth occurs in the final 4-6 weeks before birth. We’ll keep you posted and our fingers crossed for the pitter patter of little hooves. The rams can smell the pheromones to detect whether a ewe is receptive. Frankie the Oxford Down ram carrying a bright red raddle. The handsome Billy wearing his harness and raddle. Billy keeping a close eye on his ewes. 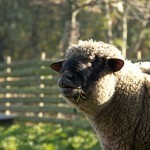 Curling the upper lip in this flehmen response allows the rams to detect pheromones that signal a ewe’s receptiveness. It takes some pretty heavy duty machinery to spread so much compost. Grazing makes up a large part of the diet of many of our livestock and ensuring our grass is up to scratch means taking care of our fields. After being nibbled all spring and summer, the fields are looking a little bare and in need of a good feed to improve their condition. We might not be able to control the weather, but we can help enrich the soil. With large grazing fields, we need a lot of compost! Spreading muck on the big field. 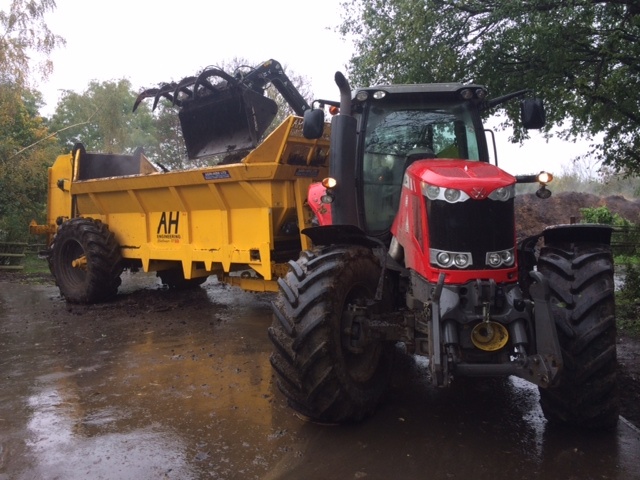 We spread a staggering 250 tonnes of mature compost across our big field with the help of contractors with their enormous machines designed specifically for the purpose. Spreading the compost across the field will distribute nutrients across the pasture and help reinvigorate areas which have been grazed nearly bare. Many thanks to S J Theobald and Sons, particularly Sam and James for all of their help. As a result of all this activity, the big field will be mucky for a while as the compost washes in and we remove any litter that may have made its way onto the fields. We appreciate your understanding during this work. 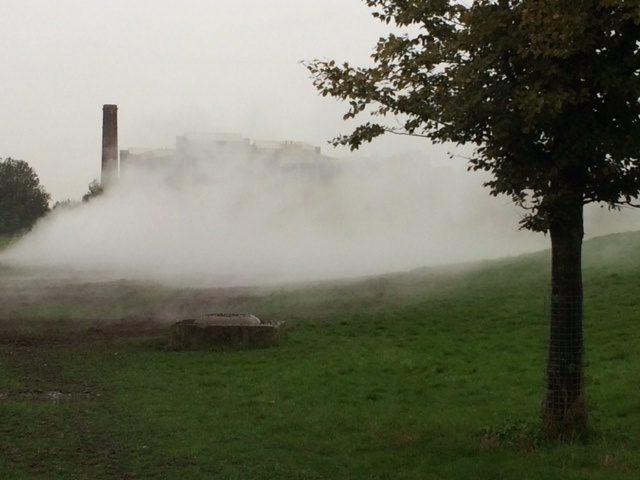 Thanks for bearing with us as we improve these fields and we look forward to lush green grass once it all settles.